Gary Thompson forces home Ballymena United's second goal in Saturday's defeat at Cliftonville, in front of the travelling support. Picture: Press Eye. Predictable probably wouldn’t be the first adjective you would use to describe covering the fortunes of Ballymena United. Yet in many ways, there’s an awful sense of deja vu when you pick through the bones of the Sky Blues’ defeats, particularly in a wretched Danske Bank Premiership campaign. Saturday’s loss at setback was another which fitted the all-too-familiar template which has become synonymous with Glenn Ferguson’s tenure in charge. All the usual ingredients were there: the almost comically avoidable goals conceded; the slow start which sees the game almost out of their reach before it has properly begun; then the usual stirring comeback which gets Ballymena to the edge of possibly claiming something out of the game, only to come up short. There’s a hint of irony that Saturday’s defeat came at the aptly-named venue of Solitude - the touchline must have been a lonely place for Ferguson after a chastening opening 23 minutes which saw Ballymena three goals down before they had pieced together a meaningful attack themselves. Memories of the infamous 7-0 drubbing at the same ground almost exactly a year earlier must have come flooding back for Ferguson and United’s crestfallen fans as the north Belfast wind and rain whipped in around them. Yet again, Ballymena were the authors of their our downfall; Alan Blayney may point to the wind which caused Chris Curran’s curling effort to drop like a stone over his head for the first goal but there is absolutely no explanation for Blayney needlessly giving away a penalty for the third goal. And yet, just as it seemed that Ballymena might have another Solitude meltdown, they came storming back with a great response - why that happens so often when the Sky Blues are in trouble rather than from the opening whistle must be an almost constant source of concern for Ferguson. Saturday was a performance which mirrored that awful let-down of last season’s Irish Cup semi-final against Portadown when the game was gone after half an hour. For Ballymena not to have learned from that is criminal. It’s not often a team scores twice in the same attack but that was what happened with Johnny Taylor’s header from a corner clearly crossing the line before being hacked clear but when it fell to Willie Faulkner, the winger’s effort was emphatic - an even better goal than his crucial volleyed equaliser in the midweek Shield win at Larne. 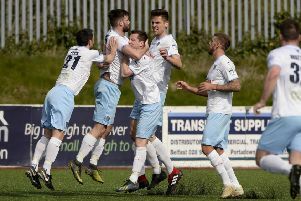 Gary Thompson’s second half goal gave Ballymena renewed hope but Cliftonville finished the stronger as it appeared that Ballymena’s midweek exertions finally began to catch up with them. United had needed every ounce of energy to get past Larne because, make no mistake, at a ground famous for its varying gradient between both ends of the pitch, that win prevented Ballymena’s season from going on an altogether slippier slope.